An additive is defined as anything added to food to preserve its flavour or improve its taste and appearance, or enhance its keeping qualities. Some additives are ancient, like salt and vinegar, but in recent decades the advent of processed food has meant that the number of additives in factory produced food has exploded, and they have become substances of both natural origin like sugar or artificial origin like saccharine, both of which are used for the same purpose. The term E-number became a byword for dangerous food additives when it was developed to be used across the Economic Community, but many E-numbers are applied to age-old foods that do no harm at all, such as turmeric. The problem arose with a small number of food additives like Tartrazine which has been discovered to cause allergic reactions in around 15% of the population and is implicated in the development and worsening of hyperactivity disorder in children. But E-numbers are also given to simple necessary additives such as baking soda, so before rejecting foods containing E-numbers it’s important to look up each E-number online or in a reference guide to find out what they actually are. What Can Food Labelling Tell Us? 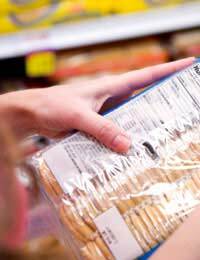 'Best before' dates appear on a wide range of frozen, dried, tinned and other foods. The 'best before' dates relate to food quality rather than safety, except in the case of eggs. When food reaches its best before date, that doesn’t mean it will become harmful, but it might begin to lose its flavour and texture. Eggs are the exception – if they pass their best before date the salmonella bacteria that all eggs contain may begin to multiply and that can cause severe health problems. Fats – shown in grams. It must also show the amount of any nutrient for which a claim has been stated – so if it says, a source of B vitamins on the front of a cereal box, it must state on the labelling how much of each B vitamin 100g or 100ml of the food actually contains. When using the food pyramid to help improve your nutrition, you need to look carefully at certain food additives which must by law be mentioned on food labelling. Sugar, for example, is something most of us need to limit in our diets, and it can be labelled sugar, cane sugar, cane syrup, glucose, invert sugar etc. Fructose, lactose and sucrose are all also sugars being, respectively, fruit sugars, milk sugars and ‘pure’ sugar. You may also see the terms maltose, hydrolysed starch and corn syrup and honey – all sugars too. The higher up the ingredient list they are, the more the proportion of sugar to the rest of the ingredients, so if sugar is in the top three ingredients, this food probably contains all the sugar you should eat in a single day. Similarly salt can be described as salt or as sodium and again, the higher up the ingredient list salt comes, the more salt there is in the food. Most adults should try to eat 6 grams or less of salt a day. Finally, fat is described on food labels as either saturated or trans fat, if it is the kind of fat we should be cutting down on, and replacing with the healthier unsaturated fat instead. Look out in particular for the heart and brain supporting omega 3 fatty acids, which occur naturally in oily fish but are increasingly found as an additive in other foods and in certain eggs which are rich in omega 3. The diet of the hens that lay the eggs is rich in the right n-3 long-chain fatty acids to produce omega 3. These eggs taste the same as ordinary eggs and have the same keeping qualities.